Every exhibit at the Redlin Art Center tells a story about the life of Terry Redlin. Terry had a deep affection for family, nature, and the fine arts. The Redlin Center features many areas that encourage visitors to connect with the artist and what he loved most. So spend an entire day with us learning about Terry’s work and inspirations. Start with our most popular exhibit, the Gallery, which houses more than 150 Redlin oil paintings. Admission is always free, so you can openly explore our many spaces. Plan your visit and experience the painted world of Terry Redlin. You can also download our gallery map before your trip. Young visitors and families are welcome to participate in gallery games, which encourage detailed study of the paintings. Participants receive a Kid Connection game card featuring gallery picture bingo, a gallery crossword puzzle, and other word games. It’s free—and children who complete the games take home a small complimentary souvenir. The Gallery features every original Redlin oil painting since 1985, set in an intentional architectural space designed for the best viewing possible. From the early drawings of Terry Redlin’s youth to the varied styles and mediums of his college training, the Early Art Room gives visitors a glimpse of a budding artist. With almost 50 original pencil sketches, view the initial stages Terry Redlin’s painting process in the Sketch Room. Like a picture storybook about the life of Terry Redlin, the Photo Gallery includes photos captured from Terry’s childhood, teenage, and adult years. You can also view photos of the Redlin Art Center being built. Step into the world of Terry Redlin in the Comforts of Home Cabin, a recreation of the lakeside cabin featured in his Comforts of Home painting. Meet Terry Redlin in five short videos about his life and works now showing in the Amphitheater and throughout the Gallery. DVDs are available for purchase online. Terry Redlin’s wife Helene is from the Langenfeld family, famous for their ice creamery. He painted several paintings featuring their logo, and you can see Langenfeld memorabilia on display in the Langenfeld Exhibit. A great supporter of wildlife and conservation efforts, Terry designed the Conservation Park as a sort of “living painting” for visitors to the Redlin Center—and, of course, as a home for the wildlife he admired. 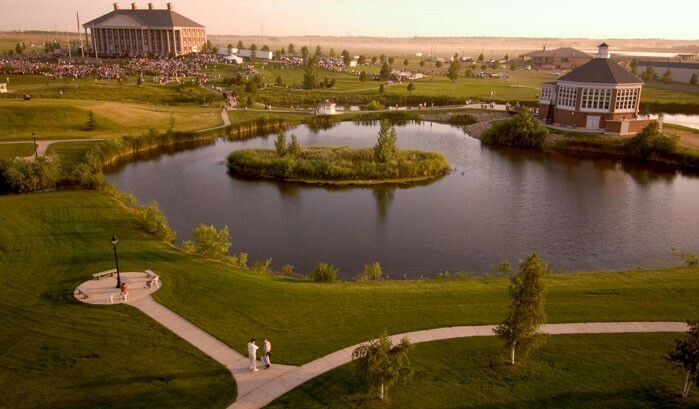 The Redlin Pavilion offers spectacular 360-degree views from the center of Terry Redlin Conservation Park; and it features eight, larger-than-life panels from the Redlin's "America the Beautiful" series. Call 605-882-3877 today to book your special event in the Redlin Pavilion. Take home fine art and collectibles to remember your visit to the Redlin Art Center.